One of the great pleasures of adventuring in the summer season is checking in on the many species of plants in your favorite area as they return from a long winter. Spend enough time admiring the local flora and the plants start to feel like acquaintances in a familiar ecosystem, from subtle lichens to stately old-growth trees. Each has a character of its own, and discovering this character is well worth a little time and observation along the way. 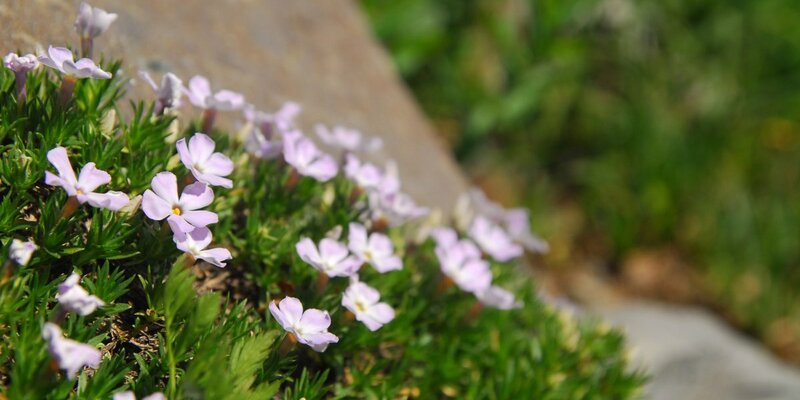 Spreading phlox (Phlox diffusa). Photo by Tyson Gillard. Found a lovely lily (Calochortus albus) in a shady adenostoma thicket near Coulterville, in company with Adiantum Chilenese. It is white with a faint purplish tinge inside at the base of the petals, a most impressive plant, pure as a snow crystal, one of the plant saints that all must love and be made so much the purer by it every time it is seen. It puts the roughest mountaineer on his good behavior. With this plant the whole world would seem rich though none other existed. It is not easy to keep on with the camp cloud while such plant people are standing preaching by the wayside. Of course, we can't all be as gifted at seeing the souls around us as John Muir was, but that shouldn't stop you from reacquainting yourself with some of your favorite species along the trail. Whether you run with the riots of showy lupine, paintbrush, and arrowleaf balsam root crowd or you prefer the gossipy flutters of aspen and cottonwood groves, summer is definitely social hour, and Outdoor Project has heaps of adventures featuring these unique characters. We've listed a few below, but please let us know where you go to check in with some of your favorite species!